Nautica provide a wide selection of apparel for men, women and kids as well as a large selection of home items and accessories like watches and small leather goods, fragrance and swimwear. Get 20% off your entire online order and 30% Off All Orders of $100+, limited time only! Quote this coupon code during checkout to save 25% off full price Men's and Women's. How to save with coupon codes for Nautica? 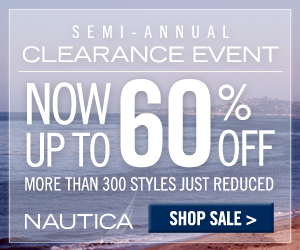 Click one of our coupon/offer links and open nautica.com offer page. Shop the Nautica online store. Enter the Nautica coupon code during checkout (When available). If there is no code provided, simply follow the offer link and the discounts will be automatically applied. Found a coupon for nautica.com?